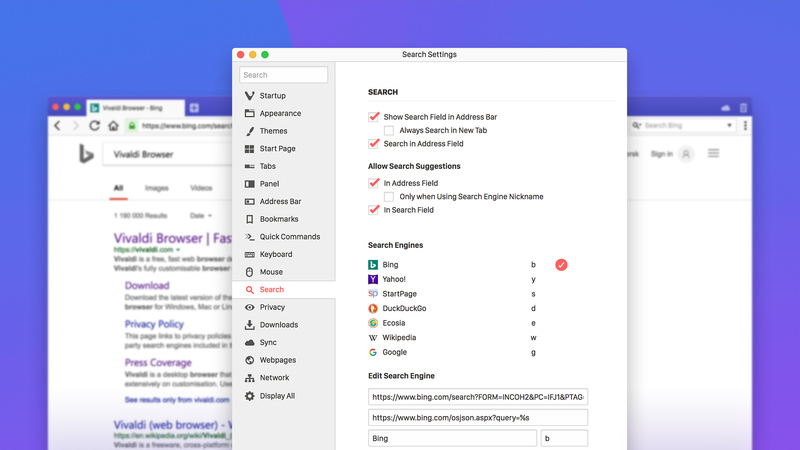 Vivaldi is all about giving you the freedom and flexibility to browse exactly the way you want – and our approach to search engines is no different. In Vivaldi, you can set your default search engine to anything you like. However, we also have a selection of predefined options to choose from. This is a job we do not take lightly. We only include search engines that our users want. Let’s look at the ones available in Vivaldi by default. Please note that localized versions of Vivaldi may include other options that are not listed in this article. 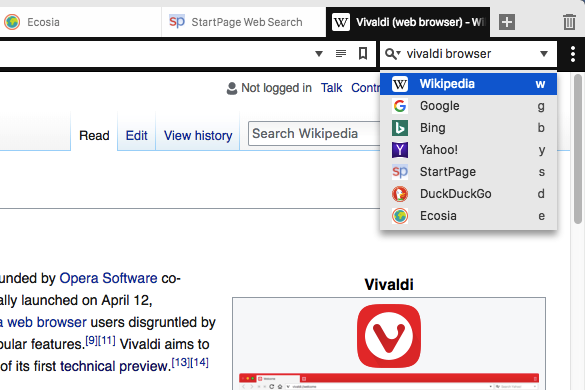 The powerhouses of the search engine world, Yahoo, Bing and Google are available in Vivaldi by default. These would be optimal choices for users who aren’t looking for any specific, tailored functionality in their search engines and are happy with a generic option that delivers quality results, fast. 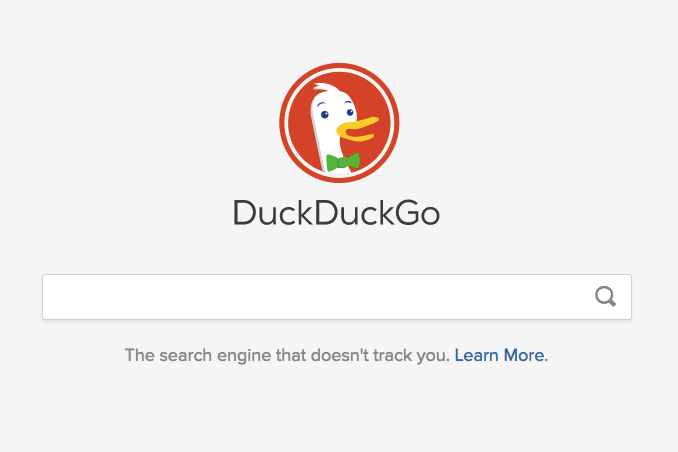 DuckDuckGo is a search engine that doesn’t track users. It doesn’t collect any personal information on its users and features a cleaner design with less clutter and fewer ads. Because DuckDuckGo doesn’t collect user data, it doesn’t base the results it returns on what the company believes “particular users would already agree with”. 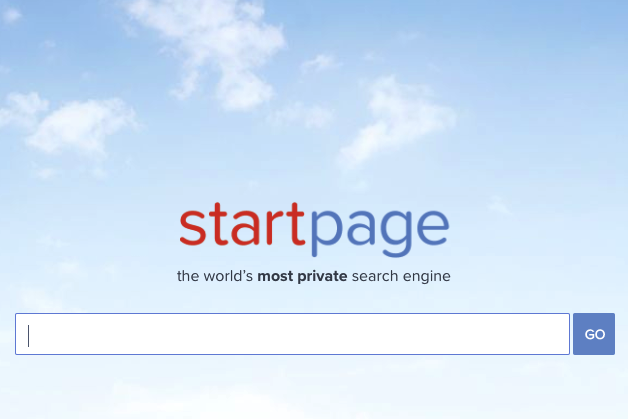 StartPage is also focused on users’ privacy but in a slightly different way. They utilize Google’s search engine but anonymize any tracking of user behavior. This means that users get high-quality search results, skipping the bit where a search engine would send any personal user information to Google’s servers. This search engine also doesn’t filter results based on past searches and online services used. StartPage has a third-party privacy certification by EuroPriSe. 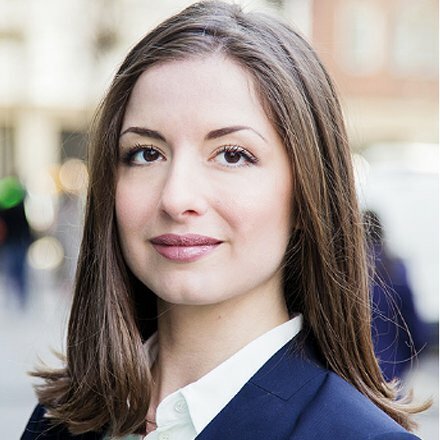 Another advantage for privacy-focused users is that StartPage is based in the Netherlands, which means that the U.S. data collection programs like PRISM, the Patriot Act, FISA courts, etc. do not directly apply to them. In April 2017, Vivaldi partnered with Ecosia, giving the eco-conscious users easy access to a greener search engine option. 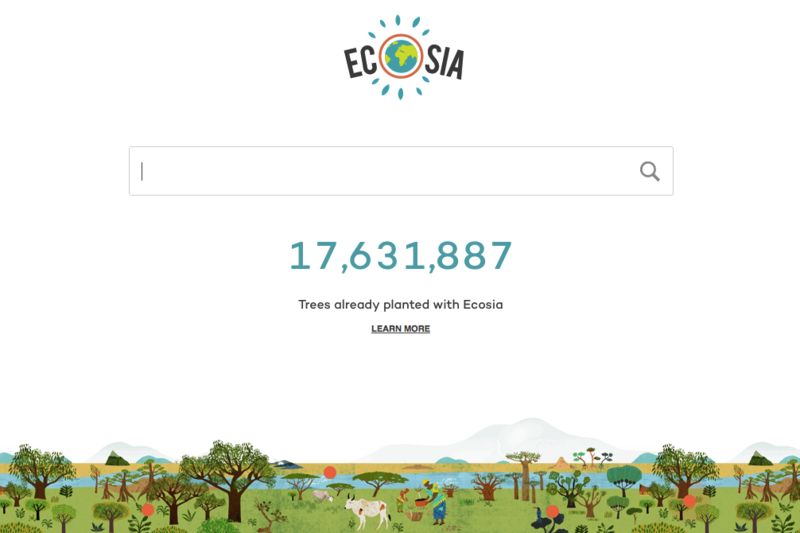 As a result of this partnership, those of you that choose to search with Ecosia can turn your web searches into trees planted in the world’s most environmentally threatened areas. Ecosia donates at least 80% of its profits from search ad revenue to support tree planting programs around the world. Berlin-based Ecosia uses Bing’s technology, enhanced with its own algorithms. Searching with Ecosia, you will see a small tree counter appear in the top right corner of the page. It will show a personal record of how many trees you helped plant. We know that many of you do heavy research as part of your daily work. Using Wikipedia as a search engine, you get instant access to articles available on this free online encyclopedia. Lots of great options to choose from, right? If you can’t make up your mind, don’t. Vivaldi gives you instant access to all of these options. To switch between search engines, simply click the magnifying glass button in the Search Field and select one that you’d like to use from the drop-down menu. 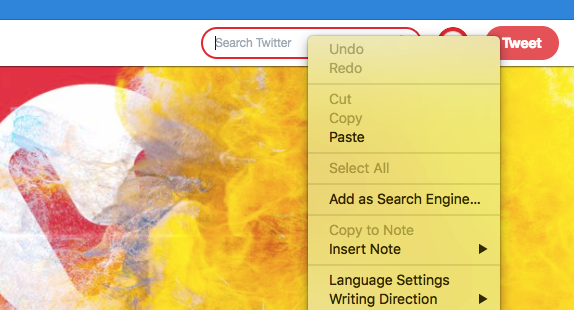 There’s even a quicker way – you can switch from one search engine to another in an instant by simply typing its nickname in front of the search term, followed by space. For example, if you type “e Vivaldi browser”, you will see the search results displayed by Ecosia (“e” being the nickname for Ecosia). You can change the default search engine nicknames in Settings, under Search. Pro tip: if you enable both “Show Search Field in Address Bar” and “Search in Address Field” in the Settings, you’ll effectively have two search engines at hand at all times, without the need to use the search engine nicknames. You could use your default choice for searching in the Address Field and set another search engine for the Search Field. Easy! Need more options? We got you. If the search engines available by default are not enough and you want to add a couple (or a dozen) more, you can do that with just a few clicks. All you need to do is go to Settings > Search and enter the new search engine URL, description and nickname under Add New Search Engine. You can also add a new search engine by right-clicking the search input field of any website and choosing Add as Search Engine from the drop-down menu. Much like other browsers, Vivaldi generates revenue from affiliate deals, and this includes search and select bookmarks. Every time you search using one of our search partners, you’re helping us grow, one search at a time. The only exception is Google – we don’t have a partnership with them, however, we know that some of you use this search engine daily, so we decided to include it in Vivaldi by default as well. Over to you. 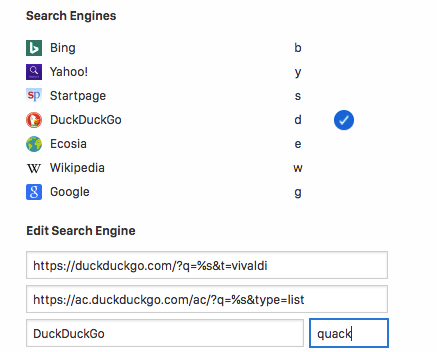 How do you use search engines in Vivaldi? We’d love to hear your search engine stories. Which ones do you use the most? Which ones have you been adding to Vivaldi? How do you jump from one search engine to another? Let us know in the comments below!